Parents preparing to bring a new baby into the home begin well in advance by attending to the new arrival’s room. Furnishings, bedding, room color, and baby proofing the environment all go into the preparation process. Time must also be taken to consider the flooring. After all, baby will be crawling before walking and will spend a great deal of time on the floor. There are a great many considerations regarding carpet versus hardwood flooring for your baby. Will your new carpet contain Volatile Organic Compounds (VOCS) such as benzene and toluene and will that put your child’s health in danger? There is a popular hardwood flooring bias in general, seeing it as the cleanest, most organic, and trendiest flooring, yet on closer inspection, there is a lot to like about carpeting for newborns. First of all, carpeting companies have become much more conscious using cleaner, healthier materials and processes in carpet construction and manufacturing. Manufacturers are creating carpets that do not contain VOC’s, and they are using recycling processes that use less water and energy. Newer carpets may be manufactured from recycled materials and organic materials, with non-toxic installations. Organic wools are wonderful, and the new clean synthetics are great for those with allergies. The green movement is very big in current carpet manufacturing. Simply look for the Carpet and Rug Institute’s Green Label for certified low-VOC and healthy materials. 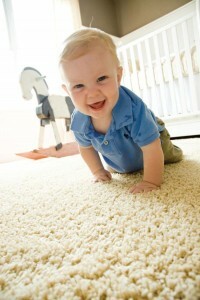 That said, “green” carpeting is a smart choice for families with, or who are expecting, a newborn. It provides comfort and warmth, and is less slippery than flooring. It also cushions an infant when falls and spills naturally occur in the growing process. And, carpet absorbs sound, which is a wonderful thing when you have a newborn. And, a good carpet is an investment that can last and last. • Use an outdoor and indoor entrance rug on which to wipe your feet. No sense in dragging the outdoors inside. Don’t forget to leave house slippers waiting for you at the front door so you’ll have something cozy to slip into. • Use a vacuum with a good filter and a beater brush to pick up dust and mites in carpet fibers, and vacuum frequently. • Keep your home ventilated and open to sunshine. Good ventilation is key. Consider houseplants that absorb toxins and give off O2 emissions to help naturally purify the air. Your home is designed to be a part of a warm and welcoming world for your newborn and nothing is more warm and welcoming than a clean carpet. With a bit of attention and care, you can provide a healthy and nurturing environment for your baby. Have your home carpeting professionally cleaned at least once a season to ensure that carpets are clean and that no harsh products are used. The experts at High Quality Carpet can assist you in preparing your home carpeting for the newest member of the family. Contact us today through our online form or by calling (732) 400-5255.